All the USB ports of a PC are plug and play, therefore if you are facing issues with your USB port, it would be related to port , driver related or device related. The following fixes will help you in identifying the root cause of the problem to resolve your USB port issues. Check Device Manager to see if your USB ports or hubs are working properly. Click the Start button. Click Control Panel. Double-click Universal Serial Bus controllers and check to see if all your USB ports, hubs and controllers are functioning correctly. Any devices not functioning will have a yellow exclamation mark in front of them. A simple method is to remove the external devices connected to the computer, one by one, and check if the line is still present. In the case that an internal device is installed, you can determine which device is failing by using the software. If you are having a Dell PC, then it has provided an online diagnostic tool to help identify and fix issues with your system. Click Hardware. Using the scroll bar on the right-hand side of the window below; locate the listing for USB. Select USB. Click Run Diagnostics. Agree to Terms and Conditions in Legal Statement. Follow the instructions to test each USB port. Run "devmgmt.msc" to open Device Manager. Under Action tab, select Scan for hardware changes and see if it helps. Locate this problematic device, and double click it. Then you will see the properties window of this device. Go to Driver tab, locate the option Uninstall and click it. Confirm the uninstall by ticking the box before Delete the driver software for this device and then click OK.
Reboot your computer with the USB flash drive connected to your computer. Then see if Microsoft will help you detect and install the new USB driver automatically. Open Control Panel -> Printers and devices. Check if you can see any entry for Unidentified USB device or Unknown Device. Open its Properties and update its driver, if an update is found to be available. If not, Go to the support website of your computer’s manufacturer, and look for the appropriate USB drivers for your operating system. If the downloaded file is an .exe file, just double click it to run the install. If it is a .zip file, please extract to a place that you can remember first, then run the .exe setup file in it to start the installation. 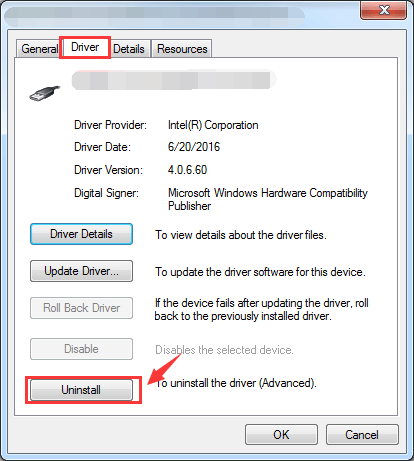 If you want to have auto download the drivers, it is suggested that you use Driver Reviver to help you with the USB drivers download and install. It will scan your PC to identify out of date and obsolete drivers. Driver Reviver can quickly and easily update these drivers to restore optimum performance to your PC and its hardware and extend its life. Finally, you can have a restart of the Windows machine by unplugging your USB and see if it gets detected then. I hope this helps in solving the port problem.